Lydia Davis - A body of work probably unique in American writing, in its combination of lucidity, aphoristic brevity, formal originality, sly comedy, metaphysical bleakness, philosophical pressure, and human wisdom. 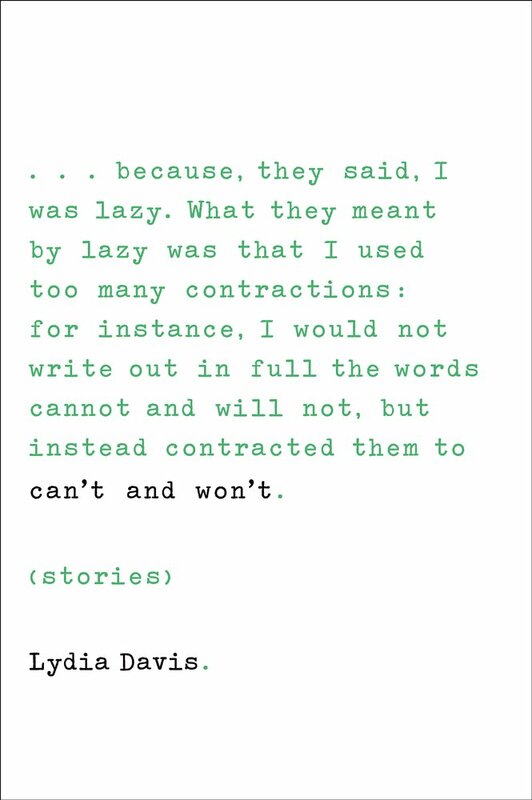 Lydia Davis, Can't and Won't: Stories, Farrar, Straus and Giroux, 2014. Five years after a mammoth, comprehensive collection of stories secured her literary legacy, this unique author explores new directions and blurs boundaries in writing that is always fresh and often funny. How quickly our eyes pass over these words. Had they been placed in the mouth of a character in a particular situation for which we had some context, we would hardly read them before moving on. But they aren’t. They aren’t part of a narrative; they are that narrative itself, in its entirety. They stand alone, with only the title, the name of a city in Indiana, for company. Through this poverty of meaning — their failure to create a world or even a three-dimensional situation — they take on extra significance, giving us more reason to linger over them, or to let them linger over us. When we do we find that they begin to speak. It happens to you often enough. You are waiting perhaps for a meeting. You find yourself in an area or a town that is not immediately familiar or unfamiliar, a place that is neutral or indistinct and where you may have been a hundred times in the past, or never before. Nothing is remarkable or memorable; nothing brilliant or terrible. It is normal. Probably these thoughts don’t occur to you, because nothing about your surroundings solicits your attention. But sometimes, for some reason, they do. If you have a little time perhaps you sit on a bench. Perhaps you think: Have I been here before? Now you begin to look, to really look, at your surroundings. You start to notice things, small first, then bigger; idiosyncrasies, quirks of geography and architecture, the peculiar gait of the people around you. Your attention is roused. You look harder, all around. Then it becomes obvious: this place isn’t normal or indistinct or ordinary, least of all boring; it has its own unique character, and a strange one at that. But strangeness — that is the muted strangeness of the everyday; the strangeness that escapes, to paraphrase Blanchot (as Lydia Davis, his most adept translator, often will) — does not immediately reveal itself; it conceals itself in the most ordinary places, and stories. You must take the time to see it, or to let it make itself seen. Only then do you realise that you are somewhere you have never been before. Perhaps even more so than in previous collections, Davis’s narrators are always solitary, their solitude not overcome, but established through proximity to others. Always loners, they sit and watch the crowd, without access to the tranquilising obviousness that comes from being part of that crowd. The most innocuous gestures become charged with unexplainable menace. Everyday objects shed their familiar skins and reveal hidden plots. It’s as though these things no longer quite form a world, or as though that world is no longer one in which we feel at home. In “The Letter to the Foundation,” a banal exchange between a waitress and customer quickly gives way to uneasy cerebrations as the prosaic forms the scene of the existential. I realized I could just as easily not have witnessed this scene, if I had chosen to stay in the bus station. . . . It would still have taken place. . . . And then, I had a stranger and less pleasant thought: not only was I not necessary to those scenes, and not necessary to those lives that continued to go on without me, but in fact, I was not necessary at all. I didn’t have to exist. Davis’s narrators are almost always in midst of some essentially normal situation, but unable to integrate that situation into the familiar world of the social throng. Instead her stories linger on the threshold of that world, exposing its artifice. This liminal, self-enclosed and yet outward looking perspective would seem to be the position of the writer. And yet, Davis is too intelligent by half to stray into any writerly heroics. The writer doesn’t have any privileged access to some deeper truth of things. Far from it: writing is referred to as a deeply suspect activity — at once treacherous (“Two Characters in a Paragraph”) and evasive (“Writing”). Rather, the detached, analytical and incisive perspective that Davis’s narratives open is simply another perspective on a world that is infinitely amenable, interpretable, ambiguous. Davis awakens the multiplicity of meanings; she doesn’t settle on new ones. To read her is to be like Josef K. in the cathedral, cast in light that’s dim and getting dimmer. Before long you can’t see at all, as you fumble your way toward the exit. The simple story loses its shape. Davis has a particularly acute eye for the contracted violence, imbalances of power, and stirrings of ressentiment implicit in prosaic social relations, brilliantly and economically captured in stories like “My Sister and the Queen of England,” “Negative Emotions,” “The Gold Digger of Goldfield,” and “The Dreadful Mucumas.” From the latter, look at this disquieting description of two maids and note how that final word — usually a term of endearment — resonates so disturbingly. They came with the apartment which we are subletting. They were bargains because of Adela’s low IQ. She is a scatterbrain. Another major theme is loss. “Awake in the Night” is marked by a melancholy ambivalence, whereas “The Seals,” a longer piece about a woman struggling to understand the loss of her sister and father, perfectly captures the experience of mourning in all its contradictions. There was also some confusion in my mind, in the months afterwards. It was not that I thought she was still alive. But at the same time I couldn’t believe that she was actually gone. Suddenly the choice wasn’t so simple: either alive or not alive. It was as though not being alive did not have to mean she was dead, as though there were some third possibility. The stories of Lydia Davis tend to challenge the general notion of what most consider “story,” rarely following a recognizable structure—rising action, climax, dénouement—and instead focusing on brief moments and recollections, some of which take up no more than a single line of text. Because of this, Davis’s narratives hew closer to that of vignette or prose poem than fiction, lyrical interludes designed to impact without the fuss of narrative webbing. But while this argument holds weight visually, it falters in that it constrains the idea of fiction to that of firm rules and chartered courses, muffling the elasticity and wonder of storytelling. In a 2008 interview with The Believer, Davis defined “story” as any writing with “a bit of narrative, if only ‘she says,’ and then enough of a creation of a different time and place to transport the reader.” This classification is a fine way of looking at the oeuvre of the author herself, for though her stories always contain some form of protagonist—even if said protagonist is the speaker of the story’s lone sentence—they purposefully dodge other expectations, shuttling the reader into an unfettered territory of language and verbal exploration. In Can’t and Won’t, Davis’s fifth collection, due out next month, the author continues to push the boundaries of narrative. The book is a remarkable, exhilarating beast: a collection that resumes the author’s overall style—short narratives, with the occasional longer piece—while simultaneously expanding her vision. 122 stories make up the volume, broken into 5 sections, and throughout, pockets of theme gradually surface—travel, loss, subconscious thought—and ostensibly unrelated pieces lock together to form intriguing puzzles that call into question life, happiness, and memory. Two story cycles, peppered throughout the text, anchor Can’t and Won’t. Both are quite strong, and in each, Davis plays with the concept of preserving the past. In the first, “dream pieces,” snippet narratives recall the nocturnal fantasies of Davis and her family and friends. These are, as one might expect, odd, but they permit Davis, so often clinging to the tangible, the opportunity to stray from reality, to bend the “regular” world. In “At the Bank,” patrons win cheap arcade prizes for guessing the correct amount of change in their deposits (“…I choose what I think is the best of them, a handsome Frisbee with its own carrying case.”). “The Piano Lesson” concerns a woman wishing to learn piano from her friend. She is given the assignment of learning several pieces, with the plan of meeting in one year’s time for the actual lesson. And “Swimming in Egypt” explores deep-sea tunnels that lead to the Mediterranean. What’s so very interesting about these stories is that, like all dreams, they contain unspoken meaning and do not follow logic. Still, Davis meets all moments of absurdity with complete seriousness, presenting each vision with little embellishment, acting as agent between the cerebral and the page, refusing to attach meaning, or to shape each discharge into a clear picture. As a result, these pieces float as if engulfed in haze, clues to an unknown psyche, snapshots of moments originally intended to not live on, but to evaporate with wakefulness. Conversely, “Stories from Flaubert,” a 14 story sequence composed of material culled from letters between Gustave Flaubert and his lover, Louise Colet, sees Davis again seizing upon past events, but using these junctures to create parallels between old and new, breathing life into moments of universal emotion. Translated, modified, and arranged by the author, these works both capture the language of Flaubert and remain complimentary to Davis’s modern narratives. Narrative echoes between the two allow Davis to reach across 160 years and demonstrate how little human thought and reaction have matured, how, regardless of advancement, there are many questions—particularly those of the mind, of life and death—that endure, haunting the human condition. One striking example of this comes in “The Visit to the Dentist,” in which Flaubert, after travelling to have a tooth pulled, passing through a former execution ground, is haunted by his subconscious, which fills his head with images of the guillotine. This same process of storytelling—building through subconscious connection—flourishes in Davis’s non-Flaubert story, “The Force of the Subliminal,” where a conversation about birthdays sparks a series of triggers, leading the protagonist to interrogate the path in which she processes thought. Maybe the words we hear spoken by the things in our house are words already in our brain from our reading; or from what we have been hearing on the radio or talking about to each other; or from what we often read out the car window, as for instance the sign of Cumberland Farms; or they are simply words we have always liked, such as Roanoke (as in Virginia). The result is a story with equal parts humor and gravity, one that introduces ideas of language and compels the reader to acknowledge and consider the way in which we as a people go about daily routine. Again, the concept of subconscious thought returns, creating another narrative echo, but the piece also, and this is something Davis is extraordinary at, paints a story within the blankness of the overall narrative, for the lack of information concerning the narrator (is it Davis? someone else?) creates a vacuum that requires the reader to mentally construct the life of the speaker. The point of the narrative is less that of the written text—though the written text is quite intriguing—and more that of the person writing. You said that in researching my qualifications, you were assisted by a Board of Advisors consisting of 10,000 “influential” people living in seventy-five countries. Yet even after this extensive research, you have made a basic factual mistake and addressed your letter, not to Lydia Davis, which is my name, but to Lydia Danj. The passage is deadpan comic, yet it further raises questions as to the motivations of the writer. Why, exactly, would someone take the time to write such a missive? What does this say about “Lydia Davis,” the character? Why enshrine this particular sliver of history through word? When examining these narratives with such a thought in place, each letter gains an enormous amount of dramatic heft, shaking away any coldness presented in the calculated, measured physical text. This abutment grants an immense amount of pleasure, and a slight case of uneasiness, for the unknown writer—mysterious, eccentric—lingers long after the story has completed. That fall, after the summer when they both died, she and my father, there was a point when I wanted to say to them, All right, you have died, I know that, and you’ve been dead for a while, we have all absorbed this and we’ve explored the feelings we had at first, in reaction to it, surprising feelings, some of them, and the feelings we’re having now that a few months have gone by—but now it’s time for you to come back. You have been away long enough. Lydia Davis, The Collected Stories of Lydia Davis. Picador, 2010. Lydia Davis is one of our most original and influential writers, a storyteller celebrated for her emotional acuity, her formal inventiveness, and her ability to capture the mind in overdrive. She has been called “an American virtuoso of the short story form” (Salon.com) and “one of the quiet giants . . . of American fiction” (Los Angeles Times Book Review). This volume contains all her stories to date, from the acclaimed Break It Down (1986) to the 2007 National Book Award nominee Varieties of Disturbance. “Big rejoicing: Lydia Davis has won the Man Booker International prize. Never did a book award deliver such a true match-winning punch, rather like one of Davis’s ingenious, playful, formally inventive and unexpectedly powerful (for their size) short stories might. Best of all, a new audience will read her now and find her wit, her vigour and rigour, her funniness, her thoughtfulness, and the precision of form, which, even among short-story practitioners known for these qualities, mark Davis out as unique . . . She’s such a reader’s writer, this daring, excitingly intelligent and often wildly comic writer who reminds you, in a world that likes to bandy its words about, what words such as economy, precision and originality really mean. It’s all about how you read and about the reflorescence of what and how things mean with Davis, who works in an understated, concentrated way and in a form that usually slips under the mainstream radar. So look again, because this is a writer as mighty as Kafka, as subtle as Flaubert and as epoch-making, in her own way, as Proust. As a translator, she has recently produced magnificent English versions of classics by the latter two, but it’s the short-story form that she’s made her own, and even changed the potential of, over three decades of honing a style whose discipline is a perfect means of release of hilarity, myth, merciless sharpness, and, most of all, of a celebration of the thinking, vital, fertile mind. What looks like a game will open to deep seriousness; what looks like philosophy will reveal playfulness, tragicomedy, ordinariness; what looks like ordinariness will ask you to look again at Davis’s writing. In its acuteness, it always asks attentiveness, and it repays this by opening up to its reader like possibility, or like a bush covered in flowerheads. Lydia Davis is either revered or ignored. She has won many awards, yet her books rarely reach the uninitiated. She is more like a secret handshake, treasured among those in the know—writers, mostly. Rick Moody has called her “the best prose stylist in America”; Francine Prose has admitted to reading Davis “when I feel that I’m becoming too narrow, too rigid, too limited”. Introducing Davis at a reading some years ago, Dave Eggers suggested that many writers can’t help but try to copy her. Davis should pick up more attention now, as Farrar, Straus and Giroux publishes “The Collected Stories of Lydia Davis”. Though she is only 62 and still writing, this book has a career-culminating formality. Weighing in at nearly 800 pages and drawn from the stories in “Break It Down” (1986), “Almost No Memory” (1997), “Samuel Johnson is Indignant” (2001) and “Varieties of Disturbance” (2007), “The Collected Stories” is the kind of backbreaker that shoves an author into the canon. He continues to break it down, and the affair continues not to add up. Davis’s language captures the disorder with a deadpan tidiness that is almost comic. It is a wisp of a story, but poignant and funny. Her sentences have an unpretentious clarity that vibrates with careful choices. From the same collection, “A Double Negative”: “At a certain point in her life, she realizes it is not so much that she wants to have a child as that she does not want to not have a child, or not to have had a child.” Davis distils the ambivalence of motherhood in two clean lines, like a logic problem or a word puzzle. Such austerity is easy to underestimate but hard to replicate. To go and see Davis is to enter the deliberative minefield of her stories. At first she is not sure whether she wants to be interviewed. Her publisher gives the go-ahead but then reneges (“Lydia needs a little more time to think it over”). Her editor tries to be reassuring (“Lydia is a very deliberative person…You might have guessed that”). After she agrees to see me, she ponders which train I should take—“each has its advantages and disadvantages,” she writes. The voice of her many narrators comes through: cerebral, conscientious, slightly awkward. We finally meet in Hudson, upstate New York, not far from where she lives with her husband, Alan Cote, an abstract painter. The station glows red in the midday sun, as if painted by Hopper. Davis picks me up and drives to a quaint tearoom nearby. “It shouldn’t be too noisy,” she says, sounding more apprehensive than confident. In her work, she shies away from descriptive detail, but in person she is reassuringly unascetic. She has crystal blue eyes, dangly earrings and painted nails (albeit in a natural hue). She enjoys fruit smoothies and loves animals. Raised in New York City by two writers, she is clearly content with her quiet country life, far from the madding book parties. She and her husband live in an old brick schoolhouse, and Davis pulls a couple of pictures from her wallet. “Oh, these are the cows,” she laughs, offering a photo of two neighbouring cows in a field, silhouetted in dawn’s blue light. Davis knew she would write at a young age—she was good, and family life was built around writing, reading and teaching. But she found the prospect burdensome, even unappealing: “I actually liked music better.” Playing the piano was instantly gratifying, unlike the struggle of storytelling, and she could happily practise for hours. But she knew she was no virtuoso (“I can hear every little thing that’s wrong”). Lessons in music theory—about structure and themes, analysis and practice—ended up helping her writing. Ever since the late 1970s (and initially alongside her first husband, the novelist Paul Auster), Davis has also worked as a translator of French literature and philosophy. Her most famous work is her most recent: a 2003 translation of “Swann’s Way”, the first volume of Proust’s “Remembrance of Things Past”. More restrained than C.K. Scott Moncrieff, it reveals Davis’s prejudices on the page. She considered each sentence a “little puzzle”, and strove to stay true to Proust’s sounds, rhythms and word choices. “What soars in this new version is the simplicity of language and fidelity to the cambers of Proust’s prose,” said Frank Wynne in the Irish Times, calling the translation “magnificent, precise”. Davis was named a Chevalier of the Order of Arts and Letters by the French government, and received a MacArthur Foundation “Genius” grant for showing “how language itself can entertain, how all that what one word says, and leaves unsaid, can hold a reader’s interest”. The award has enabled her to concentrate on her fiction for the first time in 30 years. Now on leave from her position as associate professor at the University of Albany, she still teaches special creative-writing seminars around the country. “Translating makes me much more acutely aware of shades of meaning,” she explains. “You have a set problem and you can’t get around it by avoiding it. You have to pick just the right word.” So when the chance came to translate Flaubert’s “Madame Bovary”, she seized it. She is now slogging away, four or five hours a day, to finish the job by the end of the year. Davis’s exacting use of language comes through in conversation, and her pet peeves become plain: translators who don’t understand language or who embellish with their own material, writers who overwrite, and nearly any sign of imprecision. “Proust is not overwriting,” she says, despite those sentences that famously run on for pages. “He’s actually very concise, it’s just that his subject is so large, and each sentence has to contain so much.” But anyone who simply piles on phrases is showing off, “and I’ve decided that arrogance is the thing that I hate the most”. She doesn’t believe in synonyms and flinches if a word is misapplied. When I say that some stories are like “vignettes”, she gives a thorough explanation of why the word is unsuitable—too precious, too French, too static. “It’s just one of the words I don’t like,” she concludes with a little laugh. If the direction of Davis’s writing tends toward, as she once observed in an interview, “philosophical investigation,” perhaps it is fitting that almost all of it falls into the category of the short story—a form which, in her hands, affirms its affinities with the pensée, the fragment, the meditation. For this reason, it is tempting to treat her only novel (and this in a career of over thirty years) as an anomaly. The fact that this is far from the case confirms not only the consistency of her thematic concerns but also the concentrated quality of her consciousness, which articulates long and short forms alike along comparable lines, always with the same steadfast focus. When I was first asked to write something about Lydia Davis—anything at all, be as creative as you want—my instinct was to say no. The request didn’t come at a good time (though it did come from a good source), and I didn’t know anything at all about Lydia Davis, and still don’t, apart from what I’ve been able to glean of her from The End of the Story (1995),which I read a couple of months ago now. So I begged off initially. I was busy, I hadn’t read her, etc. The truth, though, was that I’d just finished writing a whole book about a writer I hadn’t read when I decided to write about him, so I knew it was possible to set out to read and write about writers we know nothing about. In fact, the moment when we are first introduced to writers, either organically in the case of my book, or artificially in the case of what I had already come to think of as my “Lydia Davis assignment,” is a common, and in fact unavoidable, literary experience. For all that, it is one that has tended be treated fleetingly in the history of writing about reading. Among other things, Lydia Davis is a keen observer of her own mind. Terse sentences delineate some of the most intimate and urgent experiences of inner life, while characters seem to stand for isolated aspects of the self in duress as it tries to put into words the unintelligible stuff of human behavior and emotion. To assemble these voices into a portrait of the author, however, would be to miss the point of Davis’s obsessive logic. Less a collection of individual stories than a precisely crafted architecture, each story leads into the next like rooms in a dream where hidden stairways and secret chambers feel eerily familiar. Whereas Break It Down explores the shock dealt to the mind in the wake of lost love, Almost No Memory converges around our tenuous connection to our past. Imagine a literary genre much like a diary but composed for immediate consumption. A genre part commonplace book, part Blue Octavo Notebooks, part Twitter stream. Imagine something like a blog but written by public intellectuals and printed in major newspapers, or read out on national radio or television. Imagine a column in a newspaper that is too short to make a rigorous political argument, but that isn’t necessarily aiming to either. Imagine its strong social-democratic values, often only implied and somehow still rooted in the country’s liberation from the Nazi occupation in 1945. This kind of writing is observational, street sketching really, and even though it isn’t beholden to any significant journalistic accountability, it still affects through the instant recognizability of the moments it relates. We seem to be reaching a consensus that there is something distinctly new about what Lydia Davis does. After awarding her the 2013 International Booker Prize over a slate of titans like Marilynne Robinson, Russia’s Vladimir Sorokin, and India’s Intizar Husain, the author and critic Tim Parks said that Davis deserved the award because he and his co-jurists “felt that we were reading something we hadn’t read before in any shape or form—that it really was sparkling and new and fresh, a new form for the short story, and that carried the day in the end.” Even discounting the hyped-up language of major literary awards, the claim is staggering: he essentially says that Davis is head and shoulders above nine of the greatest living writers in the world.